This article is the third in a series on the crisis that engulfed Orthodoxy in the period from 1917 to 1925. Previously, I covered the years 1917 and 1918. Today, we’re moving on to 1919, a year defined by Europe’s transition to a new order following World War I, as well as the continued attempts by the Bolsheviks in Russia to obliterate the Orthodox Church. 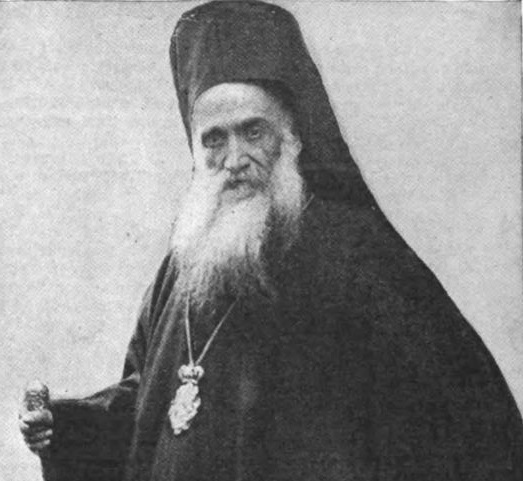 In January 1919, the British reinstated the deposed Damianos as Patriarch of Jerusalem. The Jerusalem Patriarchate’s financial crisis continued. Also in January, in Estonia, Bolshevik soldiers killed some twenty clergymen, including Bishop Platon of Tallinn. Beginning in January, the Allied Powers met in Paris to negotiate the terms of peace following the Great War. All kinds of big things happened at the conference, many of them directly affecting the Orthodox Church. In February, the Zionist Organization submitted a formal proposal to create a Jewish state in Palestine. In April, the League of Nations was formed. Ukraine was torn apart by continued violence – in the western part of the region, Eastern Galicia was annexed by Poland, an act that was blessed by the Allied Powers at the Paris Peace Conference. Meanwhile, Bolshevik troops overran eastern and central Ukraine. Belarus had declared itself independent of Russia in 1918, but that independence wasn’t recognized by most of the world, and the country became a battleground for Polish and Bolshevik aggression. Greek Prime Minister Venizelos was one of the most prominent figures at the Paris Peace Conference, and he pushed for Greece to acquire new territory. In May, the Greco-Turkish War began, as Greek troops began landing in Smyrna. Within days, the Turkish Revolution broke out, led by Ataturk, which ultimately resulted in the end of the Ottoman Empire. In Russia at this point, the Communist leaders were making blasphemously creative efforts to undermine the Orthodox Church. In the Caucuses, they staged a mock “wedding” between an elderly priest and a horse, forcing the choir to sing the Orthodox wedding hymns under threat of death. In Moscow, they published a parody of the Orthodox funeral service, for a dog. In a church in the North Caucuses, they bayoneted the mouth of Christ in an icon and inserted a cigarette. In some churches, the Communists desecrated the holy spaces by holding drunken orgies. During this period of persecution, numerous saints’ relics were seized by the Communists, who tried to “expose” them as fraudulent. The Bolsheviks weren’t just mocking the Church, though – their murderous rampage continued, as well. In Kharkov, a priest was executed for criticizing the Bolsheviks, and when his wife came to retrieve his body, the Bolsheviks dismembered her (while still alive), pierced her breasts, and then executed her. In another incident, an elderly priest was tied to a telegraph pole and shot to death, and his body was fed to dogs. In August, a Serbian clergy union held an assembly, which appealed to the Serbian Church to permit the remarriage of widowed clergy. This had been a major topic of discussion for the better part of a decade, but it became a particularly big deal after the Great War, which left many priests as widowers. In November, Greece and Bulgaria signed an agreement providing for the “reciprocal voluntary emigration of the racial, religious, and linguistic minorities in Greece and Bulgaria.” In the years following 1919, practically all of the Greeks of Bulgaria – some 46,000 people – left Bulgaria and immigrated to Greece. On the other side, 92,000 Bulgarians left Greek territory for Bulgaria. As part of a series of postwar treaties, the Romanian state was united with Transylvania, Bessarabia, and Bukovina, to form Greater Romania. The Romanian Orthodox bishops in all these lands united in a single Romanian Orthodox Church, and at the end of December, they elected Metropolitan Miron of Transylvania as their primate.